By the time the day’s proceedings came to a close, Umesh Yadav had efficiently carried forward the weight of the pace department, bowling 23 overs. HYDERABAD: When debutant pacer Shardul Thakur limped off the field after hurling only 10 deliveries due to a groin injury, the weight of the whole pace battery fell on senior pacer Umesh Yadav’s shoulders. And the way he bowled on the first day of the second Test at Rajiv Gandhi International Cricket Stadium, the 10,000-odd fans present were reminded of the good old Umesh. Though the Nagpur lad has not been a regular feature in the Test scheme of things while playing overseas — turning up only thrice this year in the longest format — he worked up good pace and reverse swing on a flat track. These traits set Umesh apart during the long home season of 2016-17 when he picked up 40 wickets in 16 Tests. Though those numbers are not exactly flattering, he had time and again shown an ability to get breakthroughs, especially with the older ball when the spinners tired. All three of his wickets on Friday were crucial as the victims had looked set to score big. Shai Hope (36), Shane Dowrich (30) and most importantly, Jason Holder (52) were the pacer’s prized catches of the day. If not for the latter’s dismissal on the fag end (89.6 overs), the day would have definitely tilted a bit more in the visitors’ favour. The 30-year-old did take some time to settle in, struggling with his line and length in the initial overs. But he scythed through the batting order by trapping his first two victims leg-before and ten induced an edge from Holder. The first two were perfect examples of reverse swing at good speed. Echoing captain Virat Kohli’s criticism of the SG balls, Umesh said batting becomes easier against the older ball as bowlers struggle to gain advantage. “What happens with SG balls is that they become soft after 20 overs. So the batsmen coming later don’t face much difficulty. We neither had conventional swing nor reverse. The wicket was flat and it is important that you contain the batsmen in these kind of wickets. But it is difficult. As much as you try, the scoreboard kept ticking as they got the singles and doubles. I decided that I have to take a chance. If I also try to contain runs, it will be difficult as the partnership will only get lengthier. So my aim was to get as many wickets as possible and I just tried. So it was something different that I tried today,” he said. 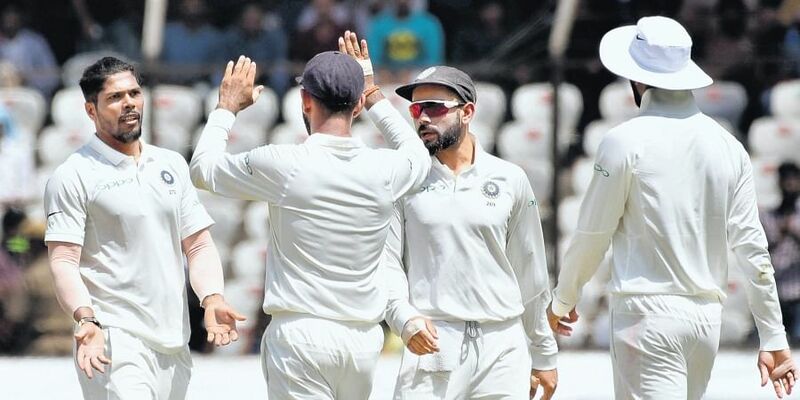 By the time the day’s proceedings came to a close, Yadav had efficiently carried forward the weight of the pace department, bowling 23 overs.“Had Shardul been there, it would have been of bigger help for the team. Like I got three wickets and if he could have chipped in with a couple, it would have only helped our team. But you can’t really do anything in these situations as this is part and parcel of the game. If he is not there I will have to bowl his quo of overs and I knew he was not going to come back. So my thought process was if the team asks me to bowl, I should be ready to do that,” he opined.With the second new ball taken in the 88th over, he might add a few more kills to his name on Saturday. West Indies (1st Innings): Brathwaite lbw Kuldeep 14, Powell c Jadeja b Ashwin 22, Hope lbw Umesh 36, Hetmyer lbw Kuldeep 12, Ambris c Jadeja b Kuldeep 18, Chase (batting) 98, Dowrich lbw Umesh 30, Holder c Pant b Umesh 52, Bishoo (batting) 2. Total (7 wickets, 95 overs) 295. FoW: 1-32, 2-52, 3-86, 4-92, 5-113, 6-182, 7-286. Bowling: Umesh 23-2-83-3, Shardul 1.4-0-9-0, Ashwin 24.2-7-49-1, Kuldeep 26-2-74-3, Jadeja 20-2-69-0.